The title might make you think this is your everyday chick-lit, but the Memory of Love is more than that. 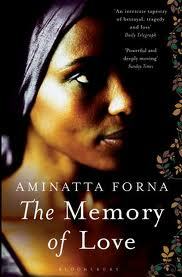 Aminatta Forna tells a beautiful story of love, loss and betrayal over 3 decades. The more you read the book, the more you realise how appropriate the title is, as each character has a memory of love that haunts them. It begins in 2002 Sierra Leone, where Elias Cole, a dying historian, tells his story to Adrian Lockheart, a British psychologist. Elias Cole takes us back to 1969 Sierra Leone, where he tells the story of Saffia, the woman he once (obsessively) loved. Outside the hospital, Adrian befriends Kai Mansaray, a young Sierra Leone surgeon, who is tormented by the memory of the civil war in the 1990s and is also haunted by the memory of love - his true love Nenebah. As for Adrian, he has left his wife and daughter in England and helps the people of Sierra Leone recover from the trauma of the civil war. He too falls in love, with Mamakay. As the story unfolds, we find out that these three men are all linked together by their love for a young woman. But we don't only meet these three characters, we meet other people. Like Adrian's patients and through their stories we get to see the real impact of war on people. The Memory of Love is possibly one of the best books I have read in a while. I keep hearing really great things about this book but have yet to pick it up. I've read her memoir and thought it was really great though and so do intend to read this eventually. Thanks for the review. You really should read it if you get the chance. The size is a bit daunting but once I got passed that it was a really amazing book. I would love to know what you think of it once you read it.